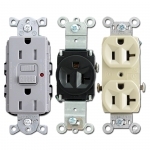 Find a complete online store of electrical outlets, light switches, GCI receptacles, rockers and dimmers for wall switch plates to easily shop by color, type or brand. Decorator colors include black, gray, white, light almond, ivory, nickel, bronze, brass, red, and clear. What type of device of you looking for? Many switches, dimmers and outlets fit decora rocker switch plates which come in a huge variety of finishes. 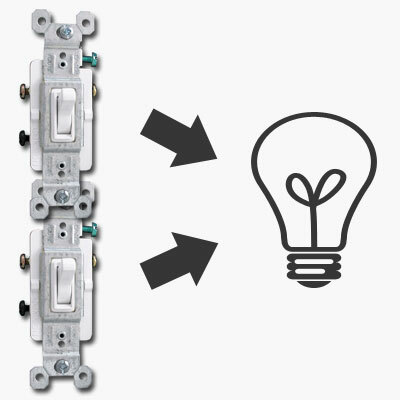 Standard decora rocker light switch. 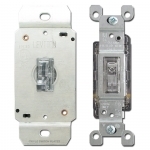 One example of a stacked light switch. 3-switch and 4-switch versions also available. 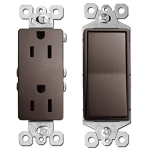 Rocker switch and plug - 2-in-1 combo devices are an easy way to add extra devices to your switch plate without installing a larger box. 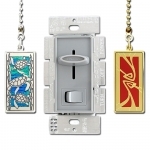 Use toggle inserts to convert a decora opening to fit a toggle switch. Cable adapters allow for cable jacks. Modular jacks can be filled with phone, ethernet and cable jacks. Blank fillers fill unused plate openings. 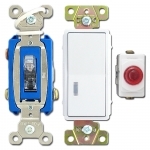 Two different types of sideways toggle controls that can easily be confused are horizontal toggle switches and despard toggle switches. Note that the base around the Despard toggles is much smaller and measures under 1" wide. 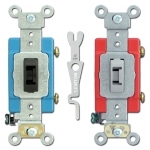 These switches fit despard style switchplates. Horizontal toggles, on the other hand, have a larger base - greater than 1" wide. 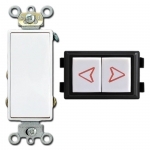 If you have horizontal toggle switches, you'll need horizontal toggle switchplates. 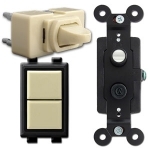 Do you sell a 2-way switch? 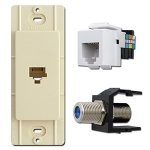 Do I need to buy narrow switches if I have to use a narrow switch plate? No, the size of the switch doesn't change. For the same reason you do not need to buy narrow electrical boxes, either. 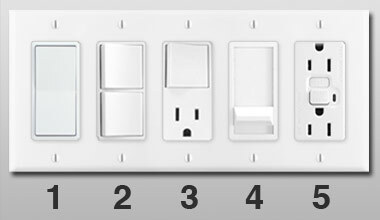 The switches are always a standard size and still need the same amount of room in the wall box, so the only difference is the size of the switch plate covering them on the wall surface. I don't have room for two switches anymore because a new bookshelf covers half of the plate. Is there a solution? 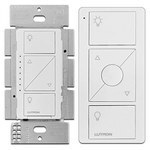 Will I need to purchase oversized switches and outlets if I'm installing oversized lightswitch covers? 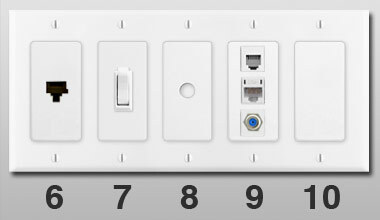 No, you do not need any special switches if increasing the size of your wall plates. 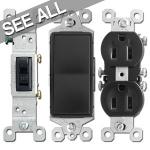 Electrical outlets and lighting switches will always stay the same size - only the overall dimensions of your switchplates will change. 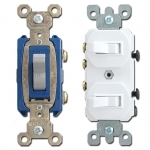 So no matter what size covers you need to use - tall, deep, jumbo, narrow, short - your switches will always fit the openings and screw holes on your wall plates. I want to locate my switches in the dark. Do I buy a pilot lighted switch or just an illuminated switch? The difference between a pilot lighted switch and regular lighted switch is when the light is showing. Pilot switches are illuminated when ON to help remind you when an out-of-sight piece of equipment is running, such as an outdoor fountain or a sump pump in the basement. Regular lighted switches, sometimes called locator switches, are illuminated when OFF so that they glow softly in the dark making them easier to find. Sometimes these have a light bar, tiny light hole, a glowing center, or a full illuminated paddle depending upon the brand and style of the switching device. What color switches should I use with my switch plates? There are different approaches to choosing your switch color with part of the decision resting on the variety of devices needed to address your lighting needs. Will you need four-way switches? 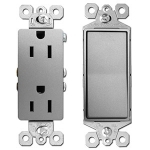 20A outlets to run heavy duty appliances? 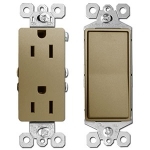 Combination switch/outlet devices for tight spots? 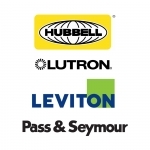 Specialty dimmers to control too-bright lights? Generally speaking, you'll want a consistent electrical device color within a single room or area. 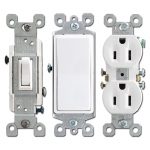 It is perfectly acceptable to change colors throughout your home, for example satin nickel switches with stainless steel plates in a kitchen, bright red switches on a dramatic accent wall, black outlets in a bathroom with black marble counters or tiling, or pleasing almond electrical wiring devices in a bedroom. 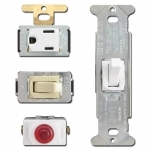 View all switch finishes & cover plates. 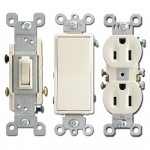 Matching Switches and Covers The most common approach is to choose outlets and switches that match your switchplates - white with white, brown with brown, etc. 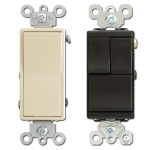 Kyle Switch Plates carries ten electrical devices finishes - white, black, brown, light almond, ivory, gray, clear, nickel, bronze and red to make this easy to do. Devices with Complementary Plates For plates without direct color matches such as metals (brass, bronze, aluminum, etc. 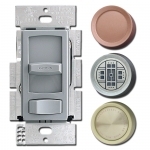 ), antiqued finishes, or multi-colored surfaces, choosing the best switch finish depends more upon the variety of devices needed to address your lighting needs. You'll find the most choices in white, ivory, and brown; somewhat fewer choices in black, gray, and light almond; and a more limited selection in clear, red, nickel and bronze. 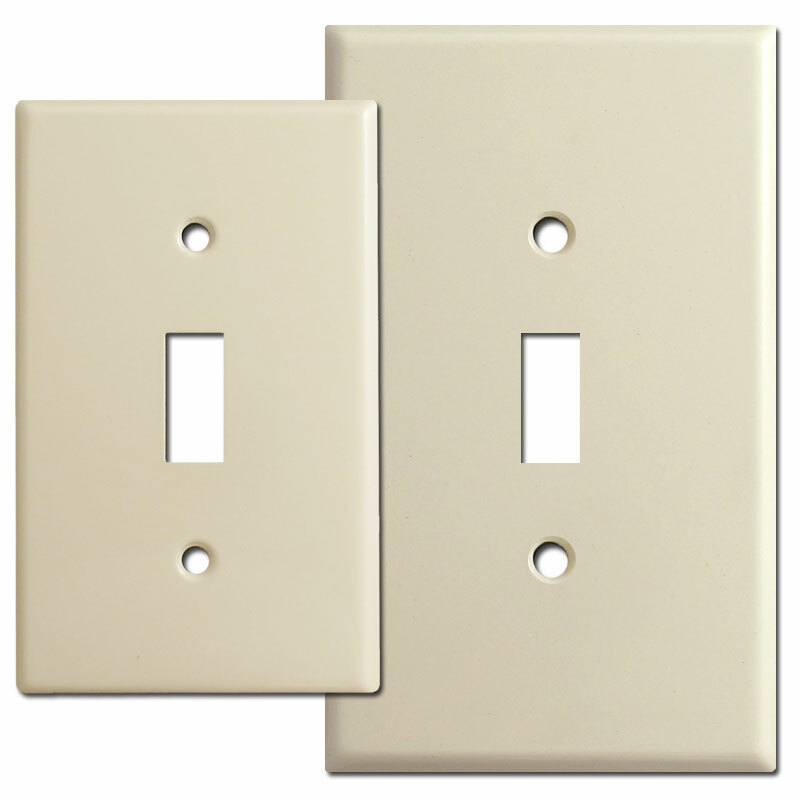 Generally speaking, lighter colored wall plates look best with white, almond or ivory; darker plate finishes look best with black or brown; and silvery metal finishes look best with nickel, gray or clear. 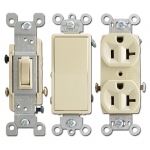 Match Trim Colors Contrasting electrical switches and outlets can be used to dramatic effect if matched to window casings, doors, moulding, banisters, and other trim. 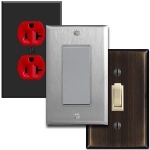 Too much of a single color becomes visually overwhelming and boring, so electrical switches can provide needed contrast that carries the eye through the room with a unified, designer touch. Painted Switches While some choose to paint their electrical switches, in general we do not recommend this approach. Electrical devices receive a high degree of use, and painted surfaces will show wear and tear much more quickly. (Just look at the paint around your current electrical devices in high traffic areas - you'll likely notice evidence of wear.) Furthermore, outlets will scratch easily because the paint is not bonded with the plastic. So bumps and nicks from rings, fingernails, electrical plugs, etc., will begin to take their toll. 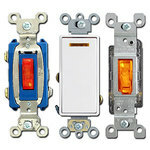 While painting switch plates can be done, electrical devices with their many angles, slits, and openings are much more difficult to paint with professional results. Painted surfaces are much harder to clean, so if you do not need an additional project in your life, skip painting your electrical switches and choose from the huge variety currently available. Specialty Colors While some manufacturers produce electrical devices in unusual colors - pink lemonade, toasted coconut, granny smith apple - you may want to stay away from these. Besides being extremely difficult to match, changing tastes and times may leave you with colors that are discontinued, so if you ever update your lighting or want to add an extra outlet to accommodate charging stations or computers, you may no longer find "your" color available. 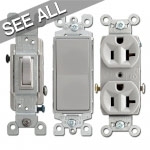 And we can't tell you how often we hear that wall plates were broken or accidentally tossed out during a remodel. 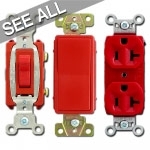 Think longterm - buy electrical switch colors with timeless appeal.